On 27th September the APWG released their First Half 2009 Phishing Trends Report. This provides some interesting/worrying reading. 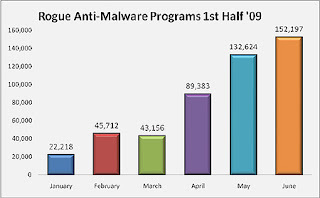 Most notably is the rise and rise of rogue anti-malware programs. Rogue anti-malware programs are programs that run on a user's machine and falsely identify malware infections. They then inform users that the malware can be removed by purchasing their anti-malware program. The installed software, in many cases, does absolutely nothing. The malware author has made their money off the user and doesn't care about them or the fact that their machine is left vulnerable to other malware. However, there is another breed of rogue anti-malware that will install other malware onto the user's machine, often adding them to botnets or adding trojans and spyware. According to Panda Labs' Luis Corrons, rogue anti-malware programs are proliferating with "exponential growth. In the first quarter of 2009 alone, more new strains were created than in all of 2008. The second quarter painted an even bleaker picture, with the emergence of four times as many samples as in all of 2008." Most of these rogue anti-malware programs have a common root - they even look the same. So how come they aren't detected as malware? Well, often they employ server-side obfuscation so that each version is slightly different, thus defeating some signature-based scans. Also, you have to remember that many of these don't perform any malicious actions and, therefore, don't trigger other alarms. What can we do about rogue anti-malware? Well, simply don't trust anything on the Web saying that you are infected or that they will scan you for free. Do not install any anti-malware from a company that you do not know and always check for validity of links and downloads. There are many companies out there providing free basic anti-malware or sophisticated products for a relatively low price that are legitimate, such as: Panda Security, AVG, Comodo, Symantec, etc. If you do get infected by one of these programs then you need to remove it. Instructions for removing the most common ones can be found at http://www.anti-malware-blog.com/ - N.B. be warned that I have not assessed or validated their instructions and there is no guarantee that they won't cause other problems. What about the rest of the report? Well, phishing is still on the increase, with reported phishing highs for the first half of the year exceeding those of last year significantly (about 7%). 21,856,361 computers were scanned to determine host infection rates. 11,937,944 were found to be infected (54%), which is an increase of over 66% from the last quarter of 2008. Banking trojan/password stealing crimeware infections rose by more than 186%. 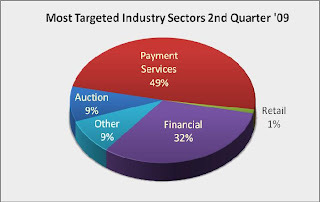 Finally, payment services have taken the top spot in the most targeted industry sector from the financial sector, although this is still a close second. To see how this compares, a previous blog post of mine on this shows how things have changed.